For people in Cape May, a perfect summer beach day is routine, but for children in Camden, a day trip to the beach is a summer highlight. Thanks to the congregation of Cape May UMC and the leadership of Rev. Jeanette Block, nearly 90 children and staff from the Camden Neighborhood Center got to have this summer highlight on July 13. As a part of their action plan developed through Team Vital, the leaders of the church made the day at the beach a priority for their congregation. Team Vital is a resource offered by Greater New Jersey that helps leaders create a strategic ministry plan using five markers of vitality. The Cape May UMC Team Vital decided to focus on their greatest asset, the beach, and reached out to the Neighborhood Center with an invitation. Serving as a “community living room” the Camden Neighborhood Center attends and cares for struggling children and families with a mission to provide a space for academic achievement, athletic accomplishment and a flourishing arts program. The center’s mission and goals were lived out through the beach day event and the hospitality of the Cape May congregation. With the help of gift cards generously donated by local food stores, Cape May UMC provided a lunch of sandwiches, chips, pickles, cookies, and bottled water. Inside the church beach towels adorned every pew and the sanctuary’s main aisle was lined with beach toys donated by the church’s Sunday School children. Millville Westside UMC, Haddon Heights UMC, Mainland Manor, and the CAAA Insurance Company all made donations. . Dozens of volunteers from Cape May UMC, both youth, and adults, participated to help make the day a success. .
After towel and toy selections had been made, the children boarded their buses, traveling to the Philadelphia Avenue and Beach Drive beach where they found thousands of seashells previously sprinkled just for them by church member Norman Smith. The next three hours were spent in the sun and sand, playing and splashing in a warm, and abnormally clear ocean due to unexpectedly high levels of sea plankton along the South Jersey coast. For volunteers and children, the tropical waters made for a surprising treat. “I was impressed with the gratefulness of the staff and children,” said event photographer Michael Duvall. 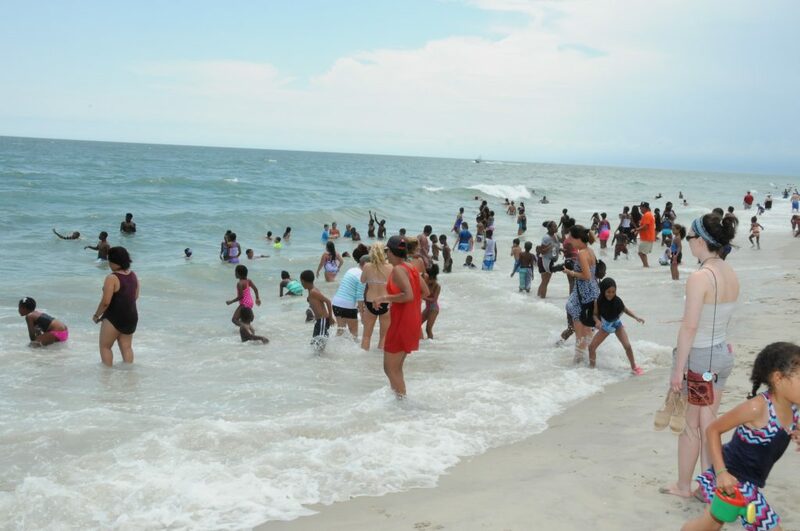 “I was also blessed to see how much fun the kids had playing in the ocean.” According to Duvall, the volunteers went “above and beyond the call of duty” to make sure the day was a success. Cape May Mayor Ed Mahaney waived beach tag fees and provided an extra lifeguard for the afternoon. By day’s end, the kids returned to their buses, slurping iced bottles of water donated by local businesses and enjoying snacks in colorful fabric bags provided by the church’s United Methodist Women. “We were impressed with the leadership provided by the Neighborhood Center,”,” said Rev. Block. Through Team Vital training, Cape May UMC assessed their community and ministry assets, became equipped for effective ministry, received technical support for putting their plans into action, and as a result, has grown in their vitality. Taking advantage of their unique seaside location the church is now planning future ministries in the wake of the successful beach day event.